Ireland centre Robbie Henshaw will leave Connacht at the end of the season and is likely to join Leinster. Henshaw looks set to fill the void left by the impending departures of Ian Madigan and Ben Te'o at Leinster. Now a key member of Joe Schmidt's Irish squad, the 22-year-old has chosen not to renew his current deal with the western province beyond this campaign. He will continue to help Connacht in their bid for success in the European Challenge Cup and Pro12 this season. The Athlone man has formed an effective centre partnership with Jared Payne for Ireland, having been paired together in midfield for the eighth time in Saturday's 10-9 defeat by France in Paris. 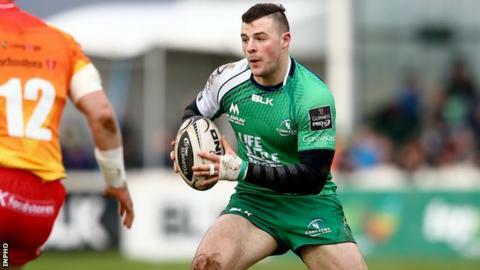 "I would like to thank everyone involved in Connacht Rugby who has played a part in getting me to where I am today," said Henshaw, who made his Test debut in 2013. "I was fortunate to be given my chance to play professional rugby at just 19 years of age and it's been an incredible journey over the past four seasons, culminating in my breakthrough into the national team. "Connacht Rugby are sitting in a strong position both in the Pro12 and Challenge Cup and I am determined to play my part to ensure we finish the season out on a high." Connacht coach Pat Lam said: "Obviously we are disappointed with the ultimate outcome of our negotiations with Robbie, however, we respect the decision he has made and wish him all the best with the Irish team into the future."